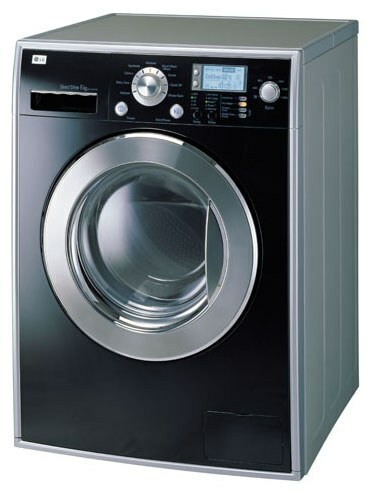 Classic your washing machine does not fit the created design of the kitchen or bathroom? You can easily change the color of its surface with adhesive tape or use a decorative painting surfaces with spray like a professional designer. To paint a washing machine, decide how to look externally this home appliances after its color, and the purchase of one or several aerosol cans of paint. Clean the surface of your washing machine from dust, dirt, carefully remove the fat, especially if the machine for a long time stood in the kitchen. If the surface of your washing machine showed signs of rust, remove the old paint. Carefully treat surface with the front and sides of the spray, which contains a remover for paint. When the paint on the surface of the washing machine will "swell", remove its remains with a metal spatula, and if in some places the old paint stays glued tightly, and once again apply to such places by wash from the spray. When you remove the old paint you can use a brush on metal, but it can be used only for cleaning metal surfaces where paint has been removed with the help of paint. In case if some areas will remain part of the old paint, evenly paint the surface of the washing machine would be impossible. Thoroughly wash the cleaned surface of the washing machine and allow it to dry so that the moisture is completely evaporated. Degrease the surface with a conventional solvent, and then apply to the entire surface of the washing machine primer, distributing it as evenly as possible, to be used in the future paint easy as smoothly as possible. Apply the primer as thin as possible layers in several layers, allowing each layer to dry pretty well, otherwise the soil will subsequently warp, and the new paint will "swell". If you are going to paint the surface of the washing machine in bright colors, use white or light gray ground, as the dark primer will subsequently be difficult to cover with paint. Primer already apply the new paint, spraying it from an aerosol can, in one or two coats shall be applied paint, you will see when applied the first coat dries. Wanting to paint a washing machine under the "sea wave" or applied to its surface a different pattern, prepare before staining cut from cardboard stencils. Gently place them on the surface of the washing machine, securing with tape, and then apply the pattern using spray cans of coloured paint alternately. But in areas where the colored pattern elements are joined together, very carefully apply paint and do not remove the stencil until it is completely dry.